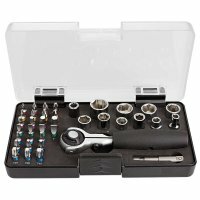 38-piece ratchet set in practical storage box with extension option for socket wrenches and bits. The swivelling T-handle and movable head allow for a better transmission of force, particularly for stuck screws. All attachments are made of chrome-vanadium steel. Bits are labelled in colour.